Subscription services are the new rage all across America, and for good reason. Clothing, razors, soaps and just about anything else you could want on a monthly basis can arrive right at your doorstep without you having to shop for it or even pick out what you want. It helps broaden your tastes, gets you into something you otherwise may not have and is generally, surprising and fun. 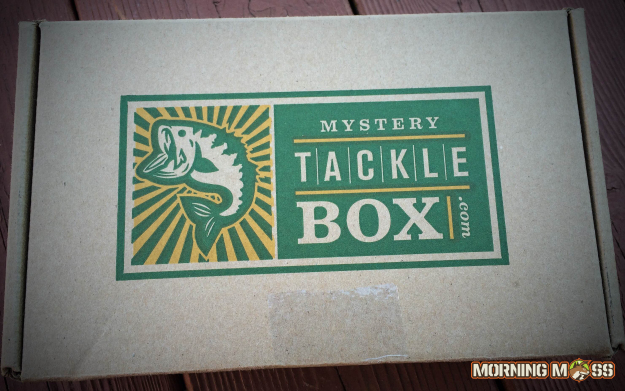 Now the awesome sport of fishing has joined in on subscription gift boxes with the Mystery Tackle Box. 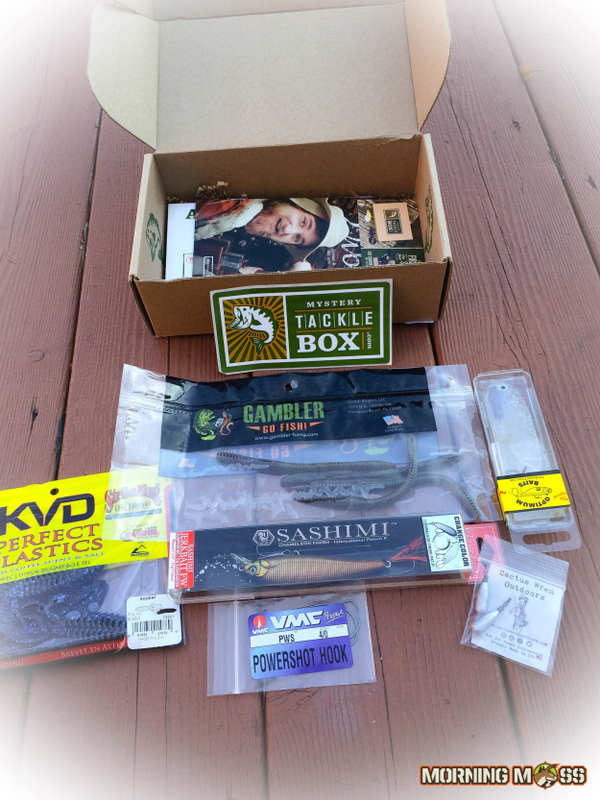 This box arrives at your doorstep once a month and includes several high quality fishing lures and gear. For the avid angler, it’s like Christmas in July (and June and August and September). Sign up for your Mystery Tackle Box subscription here. 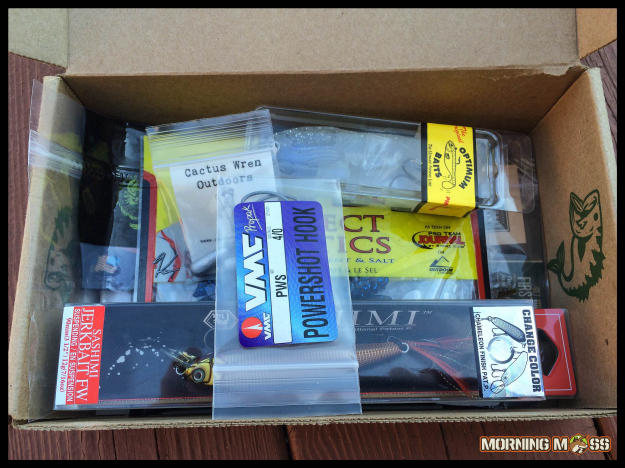 The Mystery Tackle Box Subscription comes in a box pictured above full of different fishing tackle each month. You can cancel at anytime. I had my Mystery Tackle Box delivered last week and was really impressed with the service. I chose the bass fishing box, but you could also choose the inshore salt water fishing box or the ice fishing box. The bass fishing is best suited for me since it’s what I focus most of my time on and I need more bass fishing equipment. The box included two high quality lures, one large and one medium sized, some hooks, sinkers, several bags of plastics and even scented plastics. Each box is different and you get the chance to try out some brands that you probably wouldn’t have seen or tried otherwise, so it’s really kind of fun. The idea of the Mystery Tackle Box is innovative and it’s a great gift. The price is right too. There are several plans to choose from but they start at $15.00 per month for the subscription. If you sign up for three months, right away the price drops to $14.50/month, 6 months=$14.25 and a year is $13.75. The shipping is free and you can cancel at any time so you don’t need to worry about long-term contracts. You’re going to get more than $15 worth of gear, so it can be a great deal and you’ll get items that you’ll actually use. For just $15 a month or less, you can get over $20 of tackle delivered right to your doorstep. Each box includes an “about your box” card that tells you what all came with it, what it’s used for and how much the retail value is. You also get a sticker and coupon for a gift box! Now, Mystery Tackle Box has partnered with JoinGiving.com to make a donation for every tackle box gift that is purchased. Each time a gift box is bought, the company will donate $1 to the charity of your choice. A nice way to give back while still providing a great product. All in all, this is a cool service and a great gift. Check out their website here and sign up for the service or give a gift to a friend. More hunting and fishing gear reviews right here on MorningMoss.com.